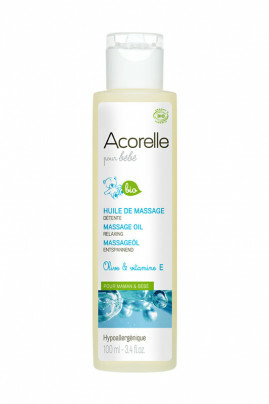 The Acorelle Organic Baby Massage Oil is specially designed for a relaxing massage for infants. Suitable for baby's delicate skin, it is hypoallergenic and composed of organic vegetable oils and vitamin E. Olive oil deeply nourishes the skin and softening sunflower oil makes baby's skin soft . Its non-greasy texture penetrates quickly. Thanks to its natural scent with sweet notes of jasmine and petit grain, it brings relaxation and soothing to the infant. The Acorelle Organic Baby Massage Oil offers a real moment of sharing between the baby and the parents. A baby skin soft and naturally nourished! Apply a small amount of organic baby massage oil in the hand and gently massage the entire body until the care penetrates. You can also gently massage the abdomen of your infant to relieve the stomachaches that can occur in the first weeks of his birth. This massage oil has a natural composition! HELIANTHUS ANNUUS (SUNFLOWER) SEED OIL *, CAPRYLIC / CAPRIC TRIGLYCERIDE, OLEA EUROPAEA (OLIVE) FRUIT OIL *, TOCOPHEROL (MIXED), PERFUME (FRAGRANCE).